Section headings and selected papers: Path Tracking and Lateral Controllers. A parametric control of individual wheel drive vehicles (P.A. Shavrin). Computer Vision. Optical flow calculation using look-up tables (J. Otero et al.). Engine Control. On-board components detection of damage for control system of diesel engine - example (R. Klaus). Intelligent Components for Autonomous Navigation. Guidance of autonomous vehicles by means of structured light (J.L. Lázaro Galilea et al.). Automotive Intelligent Components. Prediction of journey characteristics for the intelligent control of a hybrid electric vehicle (C.P. Quigley, R.J. Ball). Position Estimation. Obstacle Avoidance. Fusion of sensors applied to a collision avoidance system (J. Pontois et al.). Outdoor Navigation. Outdoor navigation of micro-rovers (S. Pedraza et al.). Wheelchairs for Handicapped. Sensor supported driving aids for disabled wheelchair users (K. Schilling et al.). Mobile Manipulators. Cooperative tasks in mobile manipulation systems (O. Khatib et al.). Marine Systems. The variable structure system synthesis for autonomous underwater robot (V.F. Filaretov, A.V. Lebedev). Ultrasonic Sensors. Short distance ultrasonic vision for mobile robots (J.R. Llata et al.). Agriculture and Forestry. On line measurement of grass flow in the field (C. Werkhoven). Perception. Simulation of a radial laser scanner for developing mobile robotic algorithms (A. Reina, J. Gonzalez). Suspensions. An active suspension based on self-organizing maps (D. Moshou et al.). Path Planning. Path planning method for mobile robots in changing environments (F.J. Blanco et al.). Control Techniques. Software Components. Using the RS language to control autonomous vehicles (G.V. Arnold, S.S. Toscani). Author index. 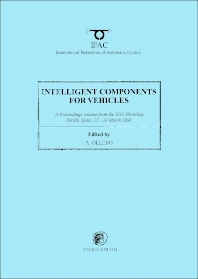 The IFAC Workshop on Intelligent Components for Vehicles (ICV'98) was held in Seville (Spain), on March 23-24 1998. The event follows the Workshop on Intelligent Components for Autonomous and Semiautonomous Vehicles (ICASAV'95) held in Toulouse (France, October 1995). The main objective of ICV'98 was to bring together specialists on components and instruments for automotive systems, mobile robots and vehicles in general to enhance the value of their experience in both hardware and software intelligent components. Future vehicles will deal more and more with autonomous functions to improve safety and traffic management and to reduce consumption and pollution. Numerous on-board decision systems will replace the driver in critical running phases. The problems and solutions experienced, by adopting this new technology, will bring out many common points with other transportation systems and mobile robots. Research and Developments on Mobile Robotics have produced many components for perception, control and planning that can be used in vehicles for collision detection and avoidance, position estimation, guidance and manoeuvering aids for drivers, advanced teleoperation, and other applications. The topics of the Workshop are in an emerging field in which the research is quickly being converted into industrial products. Several applications in the automotive domain, marine vehicles, agricultural and others were included in the program. In addition to the presentation of the papers, ICV also included a plenary talk and a round table about intelligent components for future vehicles with the participation of several industrial companies.